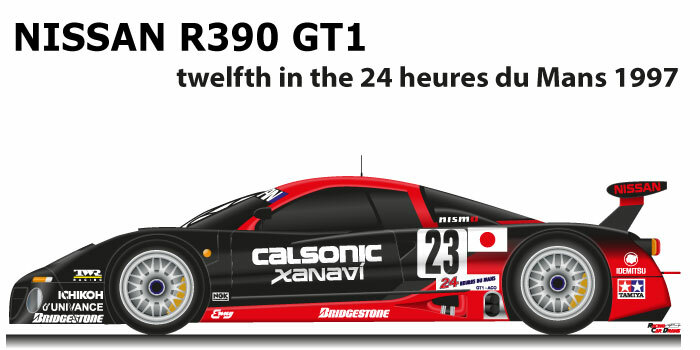 The Nissan R390 GT1 n.23 is a car that competed in the 1997 Le Mans 24 Hours. With the entry of new manufacturers such as McLaren and Porsche, the GT category had a big technical evolution. The Nissan in collaboration with Tom Walkinshaw Racing, put on the track a car that was based on the use of the Nissan R90 engine of the group C.
Kazuyoshi Hoshino, Erik Comas and Masahiko Kageyama with the Nissan R390 GT1 n.23 arrived twelfths to the 24 hours of Le Mans 1997, far from the winner TWR-Porsche. Despite the excellent performance in the single lap, in the race the three R390 deployed had continuous technical problems due to overheating of the gearbox. The only one to cross the finish line was the n.23, detached from the winner of sixty-seven laps.